As I see most people disable this option! I agree man but the majority of the registered users here o/c their PCs! That's why they disable this option as you explained above. What I would like is the ability to have it turned on, without it effecting overclocking. Even under heavy OC, it would be nice if it backed off at idle. I very much like it really, but it needs to be a bit more useful. Dunno how intel EIST is going on desktops, but on their mobiles, it kicks a fair bit of arse. that's why i use rm clock as mentioned in page 1 of this thread. 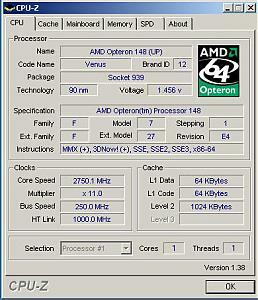 my x2-4400 is currently oc'd to 2.53ghz but it idles only at 920mghz. it jumps (in stages) to full speed when needed as my rm clock is set to "Performance on Demand". Yup intel chips have had this tech years in the form of speed step and enhanced speed step (eist) the tech has only recently made it to the desktop chips however the mobiles have had for a long time. However intel users also turn these features off as they can harm overclocking potential. I have no idea for this cos I am an AMD fan but this could be dangerous. Last edited by MrSeanKon; 19th December, 2006 at 11:44 AM. On my file server it´s enabled, and it work great. 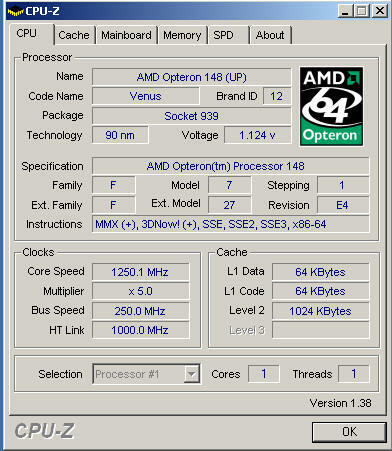 It is 1250mhz idle and 2750mhz load. I use C&Q you kan see the multiplier is going down when idle. it jumps up and down, between 5 and 11. Doesn't matter for me, F@H 24/7 so.... but for systems I build and sell, its always ON. This allows me to make pc's that run almost silent, as most people don't need as much power as they buy. Would there be any other names for this in the bios? My bios is really obscure when it comes to options like this. I have updated the bios to the latest version but there arnt any Cool n Quiet Enabled/Disabled options. Minibull You have the same board as me. I manually set the speeds and multiplier in bios, this seems to have disabled cool and quiet. Last edited by noob; 4th January, 2007 at 12:09 PM. Wow, finally another person who has the same board as me. ive now just read that setting the power saving mode to home/office turns any power saving modes off. It does, I also haven't installed any additional AMD drivers. Also make sure you are using the 6 phase addon card - gigabyte doesn't like it if you don't. Its also RAM picky if you overclock, hence my non overclocked board (haven't got round to getting any among a couple of other things), and a decent PSU is a must - which you have. Its very picky about clean power. While its not the overclocker of a DFI or Epox, It can get a reasonable overclock. For you I would look into maybe getting 2 1GB sticks of RAM, makes a difference on the board. The main problem I have is any graphics card sits over the northbridge, so putting a decent HS/Fan combo is impossible. But if you find something, it makes a large difference. Also let me know, as I have a friend which has it on water. I personally am just sticking to air until I upgrade. Change the fan on the 6 phase card, its bloody noisy, and if your CPU HS and Fan blows air over it, change it for a passive cooled HS. That way you will be able to hear the northbridge fan when the bearings start to go. Manually set all timings, including PCI and PCIe, ctrl + F1 (or shift +F1 forget which), enables additional features which you will need. Change power features to allow smart fan, which allows the monitor to change fan speed. Apart from that - any additional ramsinks on any chips that get warm (there are a couple), and decent case flow will help your overclock. Contrary to popular belief these boards can get over 300HTT before failing, they just need a much boosted cooling. Last edited by noob; 5th January, 2007 at 02:24 AM. I agree always I prefer the manual settings.